Be honest with yourself as to what success means to you, regardless of whether others approve or whether they see it as a ‘realistic’ dream. Be very clear about what you want, what is important to you and why this is important to you. The ‘why’ is especially crucial because this will ensure that you remain on course when all the guaranteed obstacles and distractions come your way. It will also help you to make informed decisions on what you are prepared to sacrifice to achieve your goals and the trade-offs that you will occasionally make en route. Furthermore, it will stop you from being envious of other women who have travelled a different path to you and who have achieved their definition of success. Having it all, means having the “it” that is important to you. Accept that you have choices and options, and own it! Now that you are clear as to what success means to you and the boundaries of what you are prepared to do to get it (i.e. the trade-offs), you need to know the various routes to getting there. There is always more than one route and more than one option, and each will have its own pros and cons. Just as when you get into a car to drive and set your destination into your satnav, it will generally give you more than one option to arriving at your destination and tell you the differences between the two routes – such as traffic disruptions and journey time differences. You should adopt this mindset when defining the routes to your goals. Although these routes are typically called plans, the ethos is still the same. Define your plans. Be clear on the choice of routes that you can take and re-assess constantly. Are alert and learn to differentiate between the resources (“the Good”), the obstacles (“the Bad”) and distractions (“the Mundane”) on your routes. 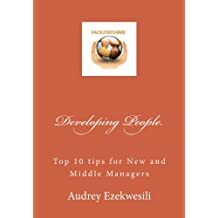 Understand the resources that are allies, such as supportive men (Chap 1), mentors (Chap 2) and good Samaritans (Chap 7) and learn how to authentically engage with these allies to propel your success and minimise the impact of the obstacles. Always remember that most obstacles and distractions aren’t show stoppers, but merely irritations to slow you down and test the veracity of your “whys” and the strength of your determination. Everyone has these distractions – don’t give up (Chap 3). In your own words – Do not fall into the trap of letting your work speak for itself. Guess what? It doesn’t. It has no mouth. In your own thoughts and beliefs – because your thoughts start a chain of reactions and actions which manifest in results. We really do become what we think and believe (Chap 10). In your behaviours and actions. We need to be kinder to ourselves (Chaps 11, 12 & 18) and to other women (Chaps 2, 13 &15). Be “unrealistic” and audacious. As long as its legal (of course), there really is no need to conform. Besides, what is “unrealistic” these days anyway (Chap 4)? Dream big and take action. Reject the desire to wait for perfection. Perfection is one of many vices (Chap 19) that derail us. Rebuke this. The key is to start, and keep your eyes open to the many resources (see no 3 above) that can help you. Be thick skinned and resilient. There are naysayers at every corner (Chap 16) and not all their advice is well meaning. Thank them anyway and move on. Be hungry to learn and develop yourself. There are no shortages of opportunities to learn from others (Chaps 1 & 2), to graciously accept help from others (Chap 7) or to work hard on yourself (Chaps 8 &9). Better to be a “work in progress” than a “has been”. ‘Do You’- Sure, we have grown up with and been conditioned to, a lot of unconscious biases about what we can and can’t do. Equally sure is that there are a lot of unfair stereotypical labels (Chap 17) given to women who have dared to overcome said biases to pursue success. You don’t have to buy into the stereotypes and you certainly don’t need to buy into the expectation that women need to abandon female characteristics/strengths in favour of male ones, in order to become successful. Act consistently confident- even when you are not feeling it. When you see the progress you have made on your actions and your plans, and the resources that you have at your disposal, your confidence will become a self-fulfilling prophecy (Chap 14). The Behind Every Successful Woman (BESW) programme for women compliments the book, promotes an alignment of women’s career and personal goals and delivers much needed performance improvements, in the core challenges that women face. Click here for more details.